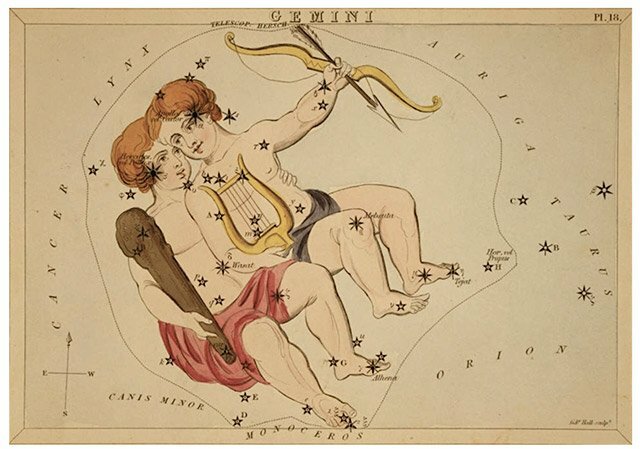 What does it mean if your Star Sign is Gemini? → Click here to read your Gemini horoscope! The Gemini symbol is that of a pair of twins. This is because this sign rarely likes to do anything alone. Gemini are never happier than when they are sharing ideas and concepts with someone else. Communication is a key element for this sign, so many of this sign go into occupations that include some communication in some large capacity. Curiosity is a key characteristic of this sign, and they are people persons. Gemini are great at parties because they can find almost anything to talk about with anyone. Gemini are adventurous by nature and so engage in traveling as often as they can as it affords them the opportunity to meet new people, experience new ideas, and to learn new concepts. Gemini are air signs, which means that they have light, airy personalities, with an effervescence that seems to draw people to them. This sign craves intellectual stimulation and often will push the envelope physically, mentally, and spiritually. If someone were to live out the book, Eat, Pray, Love it would be this sign as they are gluttons for new experiences, sometimes out of the box and out of the way experiences and people. This sign is also incredibly creative and are given to giant leaps of intuition, which makes them great entrepreneurs, designers, writers, speakers, and anything artistic. They love bright vibrant colors. Upside: Gemini are great conversationalists, and are charming people. Interesting to speak with, Gemini know a little bit about a lot of things. They have a great sense of humor and are generally optimistic people. Gemini often make their own fun, despising boredom. Downside: Gemini like to be the center of attention; always. When they perceive the situation to not be in their favor, they leave it. This can include relationships, careers, and friendships. Because of this need to be seen as important, Gemini will sometimes stretch the truth. When they are focused only on themselves they can be largely unsympathetic and rude. Male Gemini tend to change jobs often, and female Gemini change partners often due to boredom. Libra and Aquarius are also air signs.